Fox's Million Dollar Money Drop Cheats Couple Out of $800 Thousand? On Monday's episode of the new game show “Million Dollar Money Drop,” contestants Gabe Okoye and Brittany Mayti bet $800,000 on the question: which product was sold in stores first, the Macintosh computer, the Post-It Note or the Sony Walkman? The couple quickly dismissed the Macintosh and then debated between the Post-It and the Walkman, with Okoye confident enough that it was the Post-It to risk $800,000 on the answer. The show said he was wrong, but, it turns out, he was right. According to the Huffington Post, the show's producers claim they had the wrong information on the original date the Post-It was rolled out in stores. The Walkman debuted in 1979, while the Post-It debuted in 1980, the show originally thought. But internet research later revealed that 3M, who had given the show the 1980 date, was mistaken: “the product was originally tested for sale in four cities under the name 'Press 'N Peel' in 1977, sold as 'Post-its' in 1979 when the rollout introduction began and sold nationwide in 1980,” the show's executive producer said in a statement. 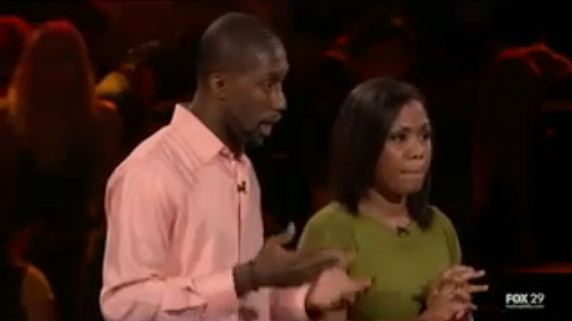 Now, despite the show learning that the question the couple were asked was answered correctly, they've only been invited back for “a second chance” instead of the show coughing up the cash. Some say, technically the couple answered the question wrong because the actual answer was “Press 'N Peel,” but technically Post-It-Notes and Press 'N Peel are the same thing, which is why it was determined they answered the question right, so where is their money?